I have a few things to get off my chest before we dive into these sticky suckers. Can peaches just go ahead and ripen on the trees around here already? Every time I walk by the peaches in the grocery store I stop dead in my tracks and practically faint from the glorious smell. And then I almost faint again from disappointment when I realize they're rock hard and from California or Mexico. I just returned from Austin, Texas. I went for a dear friend's bachelorette party. There were 14 of us. I'm tired. I did not eat from a single food truck while I was there, and that's a damn shame. Our Kansas City reception is exactly 21 days away, and I've barely given it a second thought since I booked everything. The number of out-of-town guests is growing by the minute, blowing my initial guesstimate out of the water. I have an amazing husband. He's not working this week, and as of 10:48 am, he had re-caulked the bathtub, put 2 coats of paint on a closet door that's been bare for over a year, and started painting our front door Caribbean blue. I fell in love with Caribbean blue on our honeymoon. My front door may very well be Caribbean blue when I get home today. 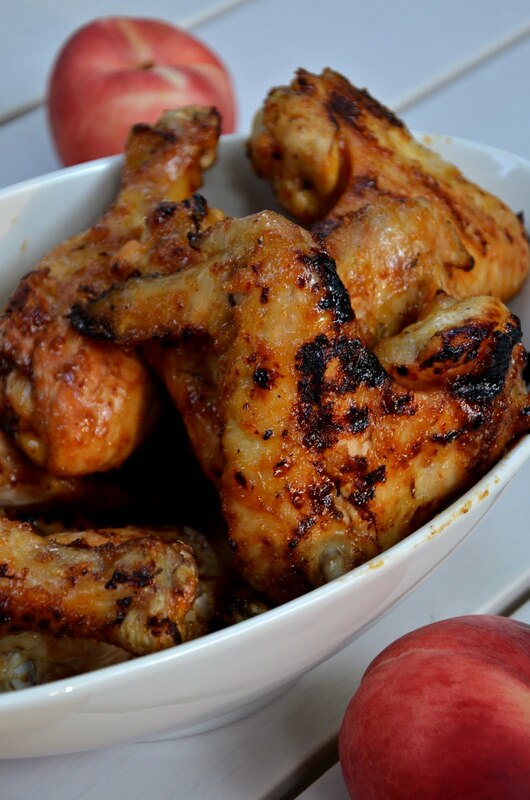 As for these peachy chicken wings, they're sweet and spicy. Sassy and sweet. Yin and yang. "We should bottle this stuff." Get your grill going. Right now if you're doing charcoal; just before you're ready to go if you're being lazy or a sissy and using gas (like me). If you are using a charcoal grill, you will need to strategically place your coals so that you will be able to cook over both direct and indirect heat (read: read the whole recipe before you start your fire so you don't screw yourself over in the end). Throw the garlic cloves and ginger chunks into a food processor with the motor running, until finely chopped. Add peach preserves, soy sauce, and red pepper flakes and pulse until smooth. Pat wings (and drummies) dry and season with salt. Take the wings, sauce, some tongs, a paper towel saturated in oil, and a basting brush out to the grill. Oil the grates well and sear the wings over the hottest part of the coals (or burners if you're a lazy sissy), turning occasionally to ensure even browning. Once you've got some good color on the wings (and drummies), move them to an area of the grill with no coals underneath (lazy sissies: turn one of your burners off; if you have 3, turn off the middle one), and baste with the sauce. Close the lid and continue turning and basting every few minutes (except last 3 minutes of cooking) until cooked through, about 15-20 minutes (longer for those drummies). Serve with any leftover sauce and a lot of napkins. Wetnaps are the preferred pairing. Thanks, Kim - you're too kind.